The “info-dump” is a long tradition in genre fiction. Inevitably, there will come a point in even the best science fiction or fantasy stories where somebody will have to pull back the curtain and tell the protagonists everything he or she knows. While there are certainly good examples of the form, the vast majority of them take the form of the book that Winston Smith reads in 1984, a long, dry section of expositional text that stops the narrative dead in its tracks and has nothing there that really adds to any of the characters or even the plot. For an example from TV, turn to “No Exit,” from the final season of Battlestar Galactica, in which the “final five” Cylons told their story not through a flashback or other visual narrative device but, rather, through one of them laying in a hospital bed and just telling everybody else what had happened. (BSG has ties to Carnivàle via Ronald D. Moore, who acted as showrunner for the former and did the same for the first season of the latter.) The best an info-dump can hope for is to fill in a few blanks in surprising fashion; the worst is when it just goes on and on, confirming stuff the audience already knows. The info-dump that opens “Los Moscos” sits uncomfortably between the two poles. 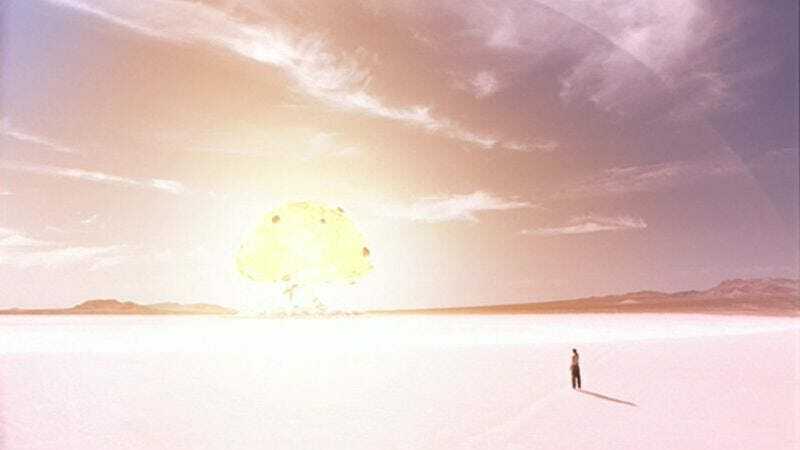 On the one hand, the vision of an atomic bomb going off—thus bringing an end to the “age of magic,” it would seem—is one of the most gorgeous images the series ever pulled off, a singular moment that immediately snaps the stakes of the series into place and sets a mission for young Ben Hawkins that seems all but impossible to complete. (Many modern dramas use our foreknowledge of what’s coming against us to both dive and deflate dramatic tension, but Carnivàle became one of the first with this moment.) On the other hand, there’s that sequence where Management introduces himself as “Lucius Belyakov” (I think I’ll continue calling him Management, thanks), then proceed to fill us in on stuff we already figured out about the dream sequences last season. Granted, this is just a quick sequence at the start of the episode, but it sets the tone for the rest of the episode, which is more direct and less atmospheric than the first season. I don’t have the strongest of memories of the second season of this show—which I haven’t revisited since it aired, outside of the series finale—but I do recall that it felt like everything really hit the ground running, sacrificing some of the weird atmosphere and mystery in favor of getting the story going. That’s not a bad thing on the whole—the weird atmosphere and mystery threatened to devour the show whole at times in the first season—but it does make the series feel a little less distinctive and loopy. This episode, for instance, is more accomplished and straightforward than anything in season one, but it’s missing some of the odd tone that clung to the edges of that season. You can see the creative team trying to make up for it in certain places (like Justin pulling off his face to reveal Ben beneath), but the whole thing also feels like a much more conventional battle between good and evil. 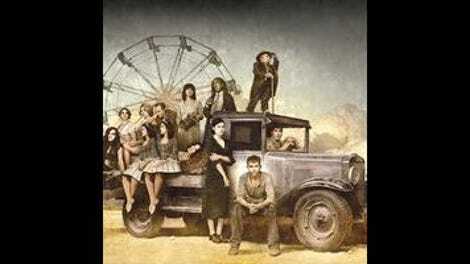 In its first season, Carnivàle was very often a show about inaction, about the way that Ben Hawkins and Justin Crowe tried to run from their destinies and constantly found those destinies waiting for them around every corner they turned. By the end of the season, there was a grim rightness to this that the series paid off in a rich, dramatic season finale that tied everything together in a long string of powerful moments. The problem that comes when you overcome a character’s tendency toward inaction, though, is that they essentially have to shift into an entirely different character. Justin has apparently lost most of the vestiges of good that he had, and he’s now just given completely into the evil stirring inside of him, his massive powers boosting the signal of the radio station he broadcasts from and secretly recruiting Vernyn Stroud, a man in prison, to be his “archangel” and apostle. This makes him a great villain, but it also loses some of the conflict in Clancy Brown’s performance, which was one of the highlights of season one. Ben, however, is still trying to play as if he’s not going to accept the mantle of avatar of light. On the one hand, this is completely realistic. Who among us would simply step up and assume the role of somebody meant to fight out a millennia old war with some guy we’d met only in dreams, even knowing it came with cool powers? Furthermore, when looked at from Ben’s perspective, this could all be the trick of an old man who can make himself invisible at will and hides behind a curtain in a beat-up old wagon. (It’s probably best not to take advice from such folks.) Management, as Samson says, doesn’t really care about right and wrong—or even understand the concept. He just wants to beat the other avatar before the next move is made, and everybody who gets in his way ends up as collateral damage, like old Lodz, who danced perfectly to Management’s tune, then ended up with his sight back, shortly before he died at Ben’s hand. It’s easy to see why Ben would hesitate to follow Management. It sounds like I’m really down on “Los Moscos,” and while I don’t think it’s an entirely successful follow-up to “The Day That Was The Day,” it still has good stuff in it, enough to recommend it as an introduction to this season of the show. But it’s so obviously an episode designed to get certain pieces into certain places that it can’t help but feel just a touch deflating. And without the weird atmospheric bits or the little touches of historical and character detail that season one offered up as a matter of course, even in its weakest episodes, the whole thing feels like it has less texture. At times, it feels as if the series received notes—from HBO, most likely—then overcompensated when trying to implement them. It’s still a good show, but it almost feels like a different version of itself, and adjusting to that will take a little time. It also feels like the budget of the series has been slashed. Where season one often chose some evocative filming locations, this episode feels as if it was all filmed in the same pasture. Similarly, many of the show’s supporting cast members have simply disappeared, with no explanation given. I do really like the opening montage, with Smith hearing Justin say, “Thou shalt be strong” on the radio. We’re starting to get a firmer grasp of Justin’s theology, and it’s increasingly creepy and insidious. Logic quibble: I get that it’s the 1930s, and I get that the skeleton of Apollonia was utterly destroyed in the fire, but how on Earth did Samson convince the authorities that her bones were Ben’s bones? You’d think they’d take them back to whatever lab they had at the time for rudimentary analysis, at least, and even in the ‘30s, a woman’s skeleton would be substantially different from a man’s skeleton. Sofie exiting the carnival is a nice moment and made even better by happening off-screen. I also liked how Samson was concerned about finding her, then had to fake being concerned about finding Lodz as well. Here’s a good sign things are moving more quickly: Justin dreams of the tree that will mark his new temple, and he finds it in this episode. In season one, it would have taken him at least five more dream sequences and seven or eight hours to get there, then he would have hemmed and hawed about it for another episode or two. The moment where Justin’s eyes run up his sister’s body, only to see her watching him, is supremely creepy. It’s fun to realize that Wilfred Talbot Smith was an actual guy, who was affiliated with Aleister Crowley. I don’t know if this Smith (who’s fairly different from the real-life version) is meant to be the same guy, but it’s a fun connection either way.